Can getting a raise be bad if it pushes you into a higher tax bracket? Everyone has a co-worker, uncle, or friend who will warn you about getting a raise because it will push you into a higher tax bracket. 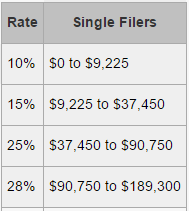 Only dollars earned above the tax bracket line are taxed at the higher rate. If your co-worker or uncle told you in October "Are you sure you want to work this November and December? It might push you into a higher tax bracket!" you would probably laugh at him. Now you can do the same when he warns you about your raise. Earning an extra dollar will never cost you more than a dollar in taxes just because it's in a higher tax bracket. Note: Although earning extra income will never cost you more in taxes than you earn due to tax brackets, there are some cases where earning a single additional dollar may push you above an income limit for a certain tax credit or deduction that you were previously eligible for, increasing your tax liability by more than a dollar. That is out of scope of this article.